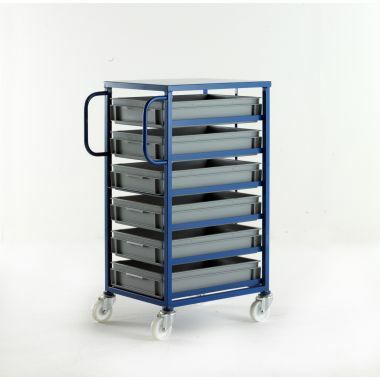 Our range of tray trolleys and mobile tray racks includes a variety of light duty materials handling solutions suitable for many environments. 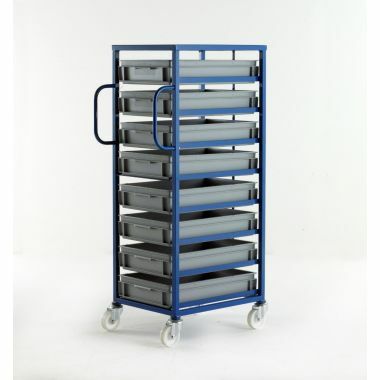 Available in a huge variety of different sizes and formats our tray trolley range is designed to provide an easily handled trolley with shelves suitable for stock picking applications and for the storage and transportation of light weight goods, components, parts or equipment. 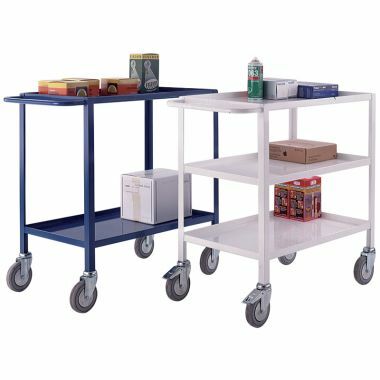 Choose from a range of tray trolleys with plywood or steel shelves, fully rigid metal trolleys, versatile utility trolleys available in a variety of formats as well as mobile tray racks perfect for component and part storage. 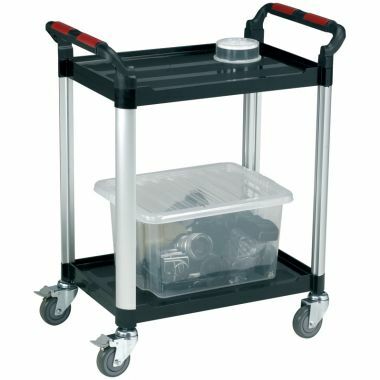 Tray trolleys are a cost effective solution for light to medium duty materials handling and storage. 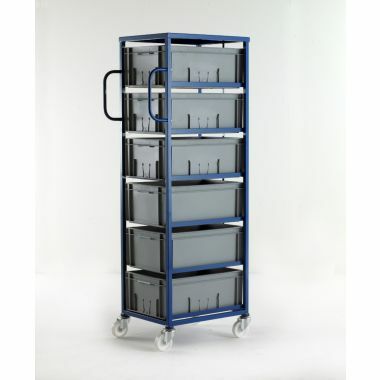 Easily manoeuvred these trolleys incorporate varying numbers of shelves in either steel or plywood formats and can be supplied in a wide range of sizes to suit individual requirements. The steel tray trolleys have ergonomically placed handles allowing the user to easily control the trolley and their shelves include a retaining lip on each edge to prevent loads from sliding or falling off. 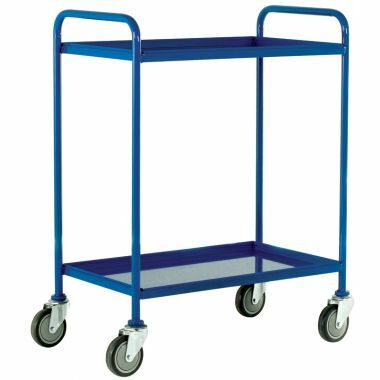 Incredibly durable these tray trolleys are often used within the retail, engineering, warehousing and general manufacturing industries. 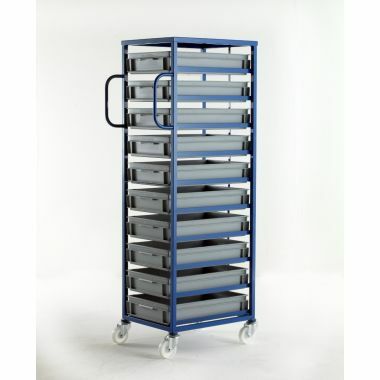 Mobile tray racks and utility tray trolleys offer an ideal solution for manufacturing environments for the storage and handling of materials, tools, parts and components. 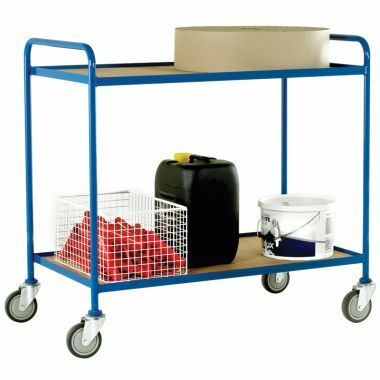 Utility tray trolleys offer a strong and durable plastic trolley complete with shelving and an array of different optional extras such as drawers and cabinets. Mobile tray racks include a multitude of different sized trays ideal for storing small parts and components that can be easily accessed at any time. Easy to manoeuvre these mobile racks are manufactured in the UK to a high standard and include different numbers of Euro stacking containers depending on the size of rack. 1. Mobile tray racks prove to be an ideal solution for storage and handling within many industries including general manufacturing and engineering. Designed to provide storage for small parts, tools or components the mobile rack holds a number of plastic trays that can be easily accessed. The strong steel framework is perfect for demanding industrial applications as it is incredibly durable and built to last. The mobile tray racks are manufactured to a very high standard in the UK and house different quantities of robust plastic containers for storage. 2. 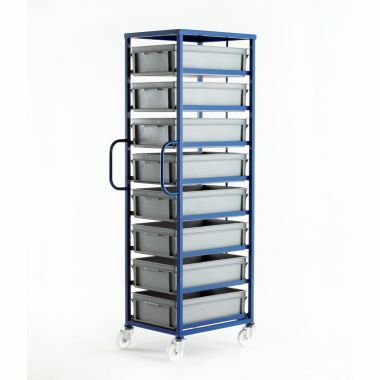 Tray trolleys are ideal for stock picking and light duty handling applications. Built to a high standard the lightweight steel mobile frame offers a durable yet easily handled mobile picking trolley that can be effortlessly wheeled about a busy warehouse, office or store room. 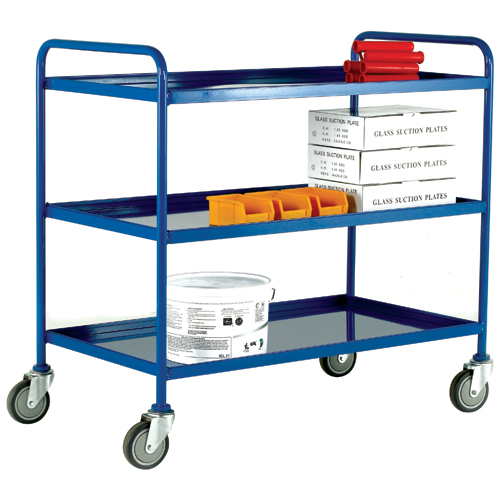 Available with plywood or steel shelves and with several different size options to choose from you are sure to find a tray trolley to suit your requirements. 3. Our range of utility tray trolleys are all supplied with a tough and durable plastic frame, braked castors and a number of shelves. Alternative models include extra shelves, cabinets and drawers to assist with storing and handling goods, tools, parts and components.